The school commemorated Earth Day on Wednesday, 22 April. However, the activities started as early as 27th March. Posters were put up around the school to raise awareness of how we can save the earth through reducing, reusing, recycling. The students were shown a video and taught to sing the song ‘Save my world, saving Gaia’ on Fridays from 13 to 22 April during assembly time. 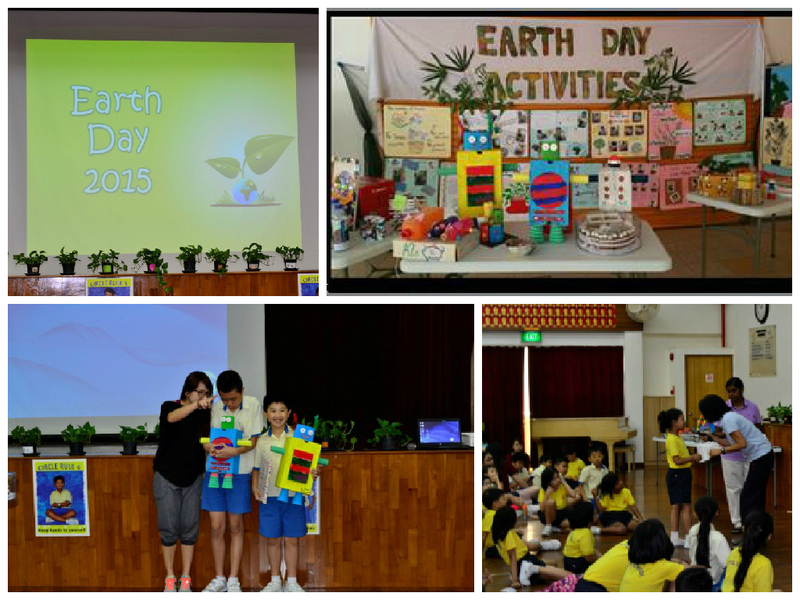 Two class-based activities ‘Looking after Money Plant’ and ‘ Recycled Art Project‘ were also carried out prior to Earth Day. Each class was given a money plant on Fri, 27th March and a vanguard sheet to record what they did to help the plant grow and how they felt looking after it. By taking care of the money plant, pupils learnt that plants provide us with clean air (oxygen) and by growing more plants and trees, we would have fresher air in our environment. Students also participated in a Recycled Art Project. Each class had to create an art piece using some recycled items or materials and it was to be submitted to the CCE committee to be judged based on its usefulness and aesthetic appearance a few days before the event. By making art pieces out of recycled materials and objects, pupils learnt that things they would normally throw away could be reused to create something useful or for decorative purpose. On the day of the celebration, the Recycled Art pieces and the money plant were displayed in the hall to showcase the effort of the classes. The Earth Day message was relayed to the students via power point slides and videos. This was followed by quiz sessions. Some classes shared their journey in taking care of the Money Pant. The celebration ended with the presentation of prizes to the top 3 winners of the Recycled Art Project.